“Unusual weather we’re having, ain’t it?” the Cowardly Lion asks in The Wonderful Wizard of Oz. It’s not a good time to be a fair weathered person. Tornadoes, floods, hurricanes, earthquakes, wars, and a bad economy make the road trip over the rainbow a treacherous one. And that’s before the wicked witches make their entrance. Lions, and tigers, and bears! Oh my! The Domino Project, with financial support from Ibex, is releasing a free Kindle version of Ralph Waldo Emerson’s essay Self-Reliance, the ultimate manifesto for following the Yellow Brick Road to self-enlightenment. In a world where conformity is the virtue most in demand, courage is hiding with the man behind the curtain. Conformity can win over courage, even at the top rung of society. “But it darkens with my first question, which concerns the treatment of Chinese dissident Liu Xiaobo, who, like Mr. Kissinger, is a winner of the Nobel Peace Prize. Henry Kissinger, of all people, was afraid to speak out. The national security advisor/secretary of state who wasn’t afraid to send thousands of American soldiers to their deaths under the freedom banner in Vietnam was afraid to speak his mind on something so obvious to anyone with any sense of self-worth and dignity. What was he afraid of? He has all the wealth, power, and prestige anyone could desire. He was awarded the Nobel Peace Prize in 1973 for his work on the ceasefire in North Vietnam. Yet he was afraid to say publicly what he could freely admit in private. Like the Cowardly Lion, he would say running away from this hard questioning from a reporter was simply showing wisdom. Smart politics. Hillary Clinton put on Dorothy’s ruby slippers and talked without fear in this Atlantic interview, calling China’s human rights deplorable, and its leaders on a “fool’s errands.” Emerson writes of fear being an instructor of “great sagacity” and the timidity of the cultured class. Emerson described Abraham Lincoln as a middle class President for a middle class America. The courage of Lincoln’s “flexible steel” was responsible for the end of American slavery. The great sages of today call for the need of both hard power and soft power. Ruby slippers and flexible steel. What’s remarkable is that the Chinese government is so afraid of this dissident with no military, no real power to speak of. Afraid enough to put him in prison for eleven years. One man who wouldn’t conform, who was arrested for trespassing onto the Yellow Brick Road. I will always remember a Chinese professor reading from Thomas Jefferson’s writings during the Tiananmen Square protests of 1989. Halfway through, she burst into tears while a government official from Taiwan watched from the back of the room with a very intense expression. It’s fascinating that the most powerful leaders in the world, with arsenals costing hundreds of billions, are afraid of one man with an idea to put on the ruby slippers and take a walk onto the Yellow Brick Road. The mere mention of his name can turn statesmen into the Cowardly Lion. 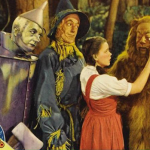 The great and powerful Wizards of Oz are simply men behind the curtain of authority, explaining perhaps why The Wonderful Wizard of Oz had so much appeal around the world, including in Communist countries (the Soviet translation had Dorothy living in a Kansas trailer). Ralph Waldo Emerson tells us if we live truly, we’ll see truly. When we persecute, we cheat nature. Courage is required to live truly, especially during tornado season.